Conway City Hall is located at 229 Main Street, Conway, SC 29526; phone: 843-248-1760. Photo: H. W. Ambrose House (also known as Dunmeade), ca. 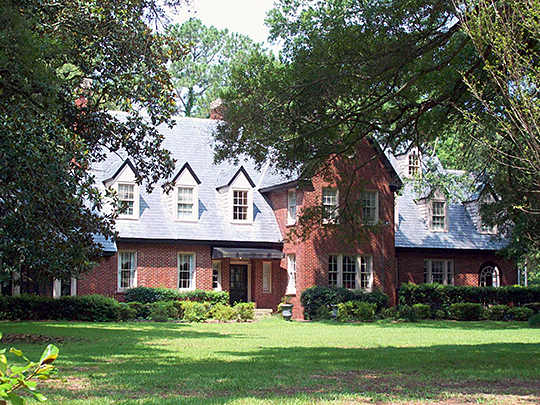 1925, 1503 Elm Street, Conway, SC. Listed on the National Register of Historic Places in 1986. Photographed by User:Pubdog (own work), 2010, via Wikimedia Commons, accessed January, 2013. One of the original townships in South Carolina was Kingston, sited on a high bluff on the inland side of the Waccamaw River. In 1732 Alexander Skene and Justice Robert Wright surveyed the area, placing the village of Kingston, which would later become Conway, at the center of the township. With a high demand for leather in Europe, the deerskin trade became a lucrative business in the first half of the eighteenth century, and by 1720 Kingston was operating as a fur trading post. With a natural landing for boats, high ground, and a reasonable freedom from mosquito-breeding swamps, Kingston was a promising site for a new town. The end of the Revolution brought more settlers to Kingston, prompting the need for further government oversight. In 1785 Kingston County was carved from Georgetown County with the village of Kingston as the county seat. In 1801 residents petitioned the General Assembly to rename the district Horry in honor of Revolutionary War hero Brigadier General Peter Horry. The courthouse town's name also changed from Kingston to Conwayborough for Colonel Robert Conway. Also a Revolutionary War veteran, Conway purchased more than 3,000 acres in land grants in and around Kingston. Relocating to the Waccamaw region from Charleston, Conway received 223 acres on the northwest side of Kingston Lake at the site of present-day Conway, was elected to serve in the General Assembly from 1791 to 1808. Once the town became the center of the district's government, it began to grow slowly. In 1801 William Hemingway was employed to draw a map of Kingston based on the existing plan. The plan showed a rigid grid pattern along the Waccamaw River and Kingston Lake, with rectangular interior lots. Small, narrow lots probably containing commercial buildings were located along Kingston Lake and the eastern boundary of the city. The streets depicted in Hemingway's plan roughly correspond to present-day Main Street, Kingston Street, and 2nd Avenue. Beginning in 1802, lots were sold to people who lived in the area and speculative buyers. Robert Conway bought Lot 135 on the William Hemingway plan and built a two-story dwelling. According to deed records, William Hemingway bought five lots for $51 in January 1803, while Jacob Anderson, Bethel Durant, John Baxter Conway, and Thomas Crowson purchased numerous properties in the developing town. At the same time that settlers were purchasing lots in the Waccamaw village, a small courthouse was constructed on Fifth Avenue, with the first session convening in 1803. While the first courthouse no longer survives, a second courthouse designed by Robert Mills in 1824 now serves as Conway's City Hall. In 1807 a post office was opened to serve the small community. According to the 1810 census, there were 4,349 inhabitants in Horry County. Ten years later the population increased to 5,025 with 1,457 slaves and twenty five free blacks. Edward Salo, Senior Architectural Historian and Paige Wagoner, Historian and the staff of the State Historic Preservation Office, Conway Residential Historic District, Horry County, SC, nomination document, 2009, National Park Service, National Register of Historic Places, Washington, D.C.